Christmas has come and gone, but not without my family celebrating it in a degenerate way that I don’t exactly recommend: spending too much of Christmas Eve and maybe even some of Christmas, and certainly the days after watching Seasons 1 and 2 of Sons of Anarchy. My husband tricked me into watching some episodes of season 4 this fall and with the Netflix instant thingie suddenly working on our tv and our children home, it just seemed like the thing to do to use our quality family time to watch people killing and swilling. 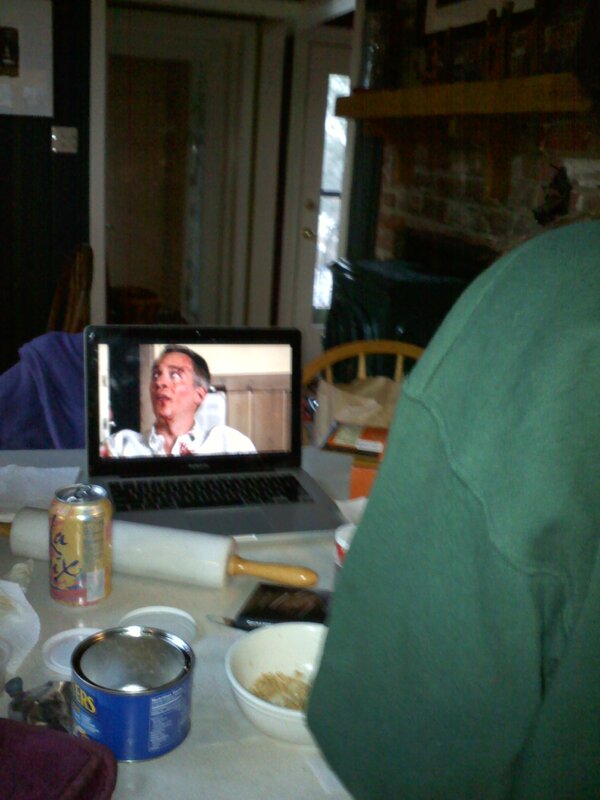 It’s hard to argue with the warmth of the family gathered round the profanity-and blood spewing television. I have to admit, I do a damned good Katey Sagal cussing impression.Makes my kids proud. During our holiday preparations, my daughter was baking molasses cookies and simultaneously catching up on an episode she’d missed on her laptop. I came in to the kitchen to see this and couldn’t resist snapping a photo.Blood and guts and batter. Such a heartwarming scene.The cookies turned out quite well, I might add. As of yet, we have not been struck by lightning or more likely if we lived in Charming, the town where the motorcycle club’s activelifestyle takes place, gunned down by a hail of bullets with all the violent and disturbing (and occasionally funny) viewing going on here during this season of peace. Katey Sagal does say “Jesus Christ” an awful lot, so maybe we’ve got the Christmas spirit, after all. And I can remember the Jesuits who taught me in college sending out a Christmas card one year with the message, “Born to die” or something durned close–ok maybe there was a reference to the resurrection there, too, but I don’t remember that. I remember being somewhat shocked by the starkness of the message–exactly their point. So Jesus would feel right at home with this gang.